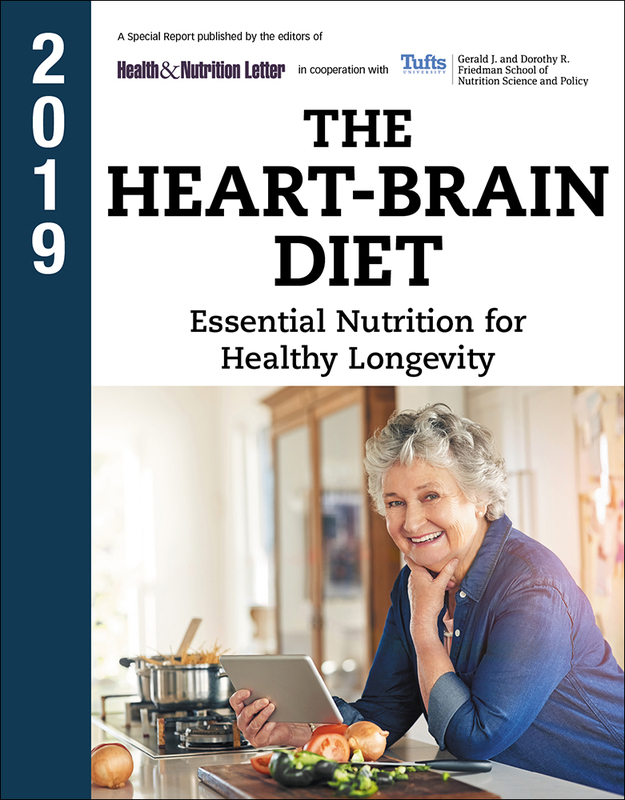 Order your copy of The 2019 Tufts Heart-Brain Diet today! You’ll see how – in as little as 10 days – you can add years to your life… years filled with good health and vitality! The 2019 Tufts Heart-Brain Diet doesn’t require you to starve yourself or give up the foods you love. You’ll discover eating plans you can stick to, recipes you’ll savor, and meals you’ll look forward to making… with results you’ll enjoy for a lifetime! What? Another diet? Yes, but it’s like no diet you’ve seen before! Whole-Wheat Lasagna with Mushrooms and Spinach…Chicken, Sausage, and Bean Stew… Asian Pork Lettuce Wraps…Whole-Grain Chocolate Waffles! Second, this diet does not come from a self-proclaimed “diet doc,” or a fitness guru, or a former film star. It doesn’t come from a food company or pharmaceutical conglomerate. The diet comes to you from Tufts University Friedman School of Nutrition Science and Policy, the only graduate and professional school of nutrition in North America. Third, and most important, it is not a diet about losing weight… it is a diet about gaining something much more lasting and vital. This diet is about adding years to your life. Healthy years. Vital years. Years with a strong heart and active mind! Get The 2019 Tufts Heart-Brain Diet. Discover eating plans you can stick to, recipes you'll savor, and meals you’ll look forward to making. It’s not television – it’s your life!There’s a rampant mindset… let’s call it The World’s Biggest Loser mindset… that says diet is all about sacrifice… that it’s all about what you give up… that it’s all about the scale. We want you to be The World’s Biggest Gainer! We want you to enjoy the blessings of increased vitality, of a sharp mind, of a sturdy heart, and of a long life. This diet is not about dropping pounds from the scale; it’s about adding years – glorious, active years – to the calendar! Food is an ally, not an adversary!The right foods are your body’s best friends. Your heart and your brain require a steady diet of nutrients. Although your body manufactures a small amount of these nutrients, most of them come from the foods you eat. Food is fuel. And just like any fuel, some foods are better than others. Some are clean and energy-efficient… and some are harmful to the engine that is your heart. Some lead to deposits in arteries… while others improve performance, decrease the need for repairs and cut maintenance. In this book, you’ll discover which foods will maximize your health and keep your heart pumping and your brain sharp. And you’ll learn how to integrate these foods into an eating plan that is easy to start and rewarding to follow. How does the heart-brain diet work?Tufts experts have identified the best, most heart- and brain-healthy nutrients. They’ve incorporated these nutrients into an eating plan that’s not only balanced; it’s also fair. The Tufts Heart-Brain Diet doesn’t require you to starve yourself, eliminate carbs, or avoid the foods you love. And the Diet does more than just provide these essential heart-brain nutrients. It also makes sure these nutrients get to where they’re needed. The Diet includes foods that will keep your arteries healthy… foods that will lower your cholesterol and control your blood pressure. A diet with foods you know — and love!Most diets fail for two big reasons: One, the diet deprives you of things you want and your body needs. As a result, you cheat. Or, the diet is bland and boring. As a result, you quit. The Tufts Heart-Brain Diet doesn’t deprive you and certainly won’t bore you. It’s loaded with variety and lets you eat the foods everyone craves – even foods you thought were diet no-no’s, like cheese and chocolate. Yes, chocolate! Chocolate – especially dark chocolate – is high in compounds that improve blood vessel elasticity. In a recent study, chocolate eaters had a 27% lower risk of heart attack! Like your morning Joe? It’s included. In fact, have a Vente! Research indicates that frequent coffee consumers might cut their risk of dementia and Alzheimer’s by as much as 65%! Or vino? Prosit! Evidence continues to show that moderate consumption of red wine can not only reduce the risk of heart disease but also offers protection against dementia. You can satisfy your appetite with dishes–like White Bean and Kale Soup with garlic bread…Oven-Fried Fish Fillets with creamy herb sauce… or Parmesan Baked Chicken with pasta. And they’re all in the 10-day plan. Plus, you’ll savor other delicious dishes, such as Acorn Squash with Walnut and Fruit Pilaf…Roasted Cod with Potatoes and Artichoke Hearts…Whole-Wheat Pasta with Spinach-Walnut Pesto and Zucchini…and Hazelnut Chicken Salad with Strawberry-Rhubarb Marinade. A diet that’s easy on your schedule — and your walletThe Tufts Heart-Brain Diet’s recipes are easy and quick to prepare. Imagine… South-of-the-Border Casserole that takes less than half an hour to make and bake… a Smoked Trout Salad you toss together in 10 minutes… and an Asparagus Onion Frittata topped with melted cheese. And there are no hard-to-find or break-the-bank ingredients… nothing exotic or expensive… just good, wholesome foods readily available at your local market. “This is delicious! I must have the recipe!”The 2019 Tufts Heart-Brain Diet will transform the way you think of food. That’s what happens when your goal is no longer about losing pounds but about gaining birthdays… when you realize the difference the right foods can make in your overall health, cardiovascular fitness, and lifelong mental agility. You’ll look forward to what’s on each day’s menu. Not only are the meals satisfying and simple to make, but each one is an opportunity to do something good for your heart, your mind, and your body. The 2019 Tufts Heart-Brain Diet is available to you at the lowest price you’ll find anywhere. The cost is a very small price for information that can make such a large difference in your life or that of a loved one. Order today and if the report doesn’t match your expectations, let us know and we’ll fully refund your money, no questions asked. And, to keep you on top of advances in nutrition, we will reserve future annual editions for you on a priority basis and at our lowest price. We will notify you via postcard or email before the next annual report is released and shipped to you. If you don’t wish to receive it, just reply within 30 days. You will also be able to review each future issue before deciding to keep it. So, come and get it! Send for your risk-free copy of The 2019 Tufts Heart-Brain Diet today!